From Mont St Michel we travelled south to the outskirts of Tours and the Loire Valley. When planning our journey, we'd decided to try and find somewhere self-catering as we reckoned my sister and niece might be getting a bit fed up with hotels by this point. I also find them a lot more comfortable when you're staying in one spot. 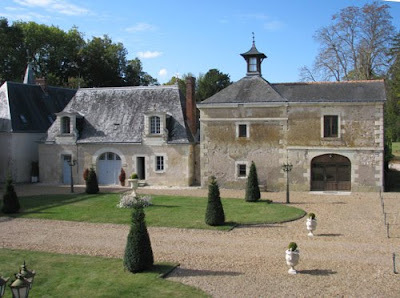 I found a cottage in the grounds of a chateau in very quiet the countryside on the northern outskirts of Tour and we made this our base for the rest of our holiday. Above you can see the entrance to the Château du Plessis - although you're missing the very fancy ironwork on the gates! Our cottage lodge (right) is just behind the tree in the above photograph. 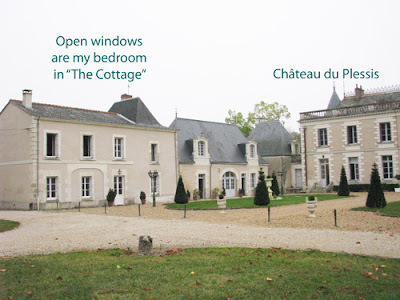 This is a view of The Cottage - to the left of the Château du Plessis. The open windows are my bedroom. The accommodation was great in terms of space. However we didn't have a key to the back door (somebody had walked off with it)and the front door was impossible to open and close easily. So the whole time we were there the doors were unlocked! This was the view from my bedroom in "The Lodge"
On the whole, if travelling in France, I'd definitely recommend looking for B&B or self-catering facilities at Châteaux as you're bound to have a much more memorable stay than you would if you stayed in yet another anonymous hotel. It can also cost about the same or even be cheaper depending how many are in your party! 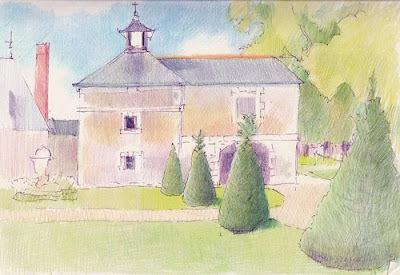 Below are my sketches that I did while at the Château. 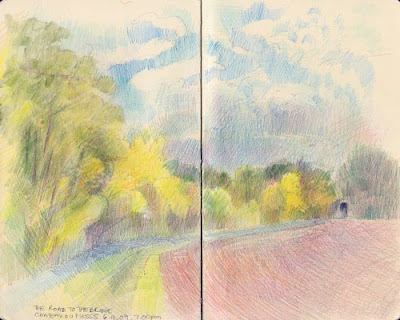 This first sketch was done while having lunch on the Sunday - we had beautiful blue skies all day but the weather forecast looked ominous.........of which more in the next post! We devoted most of Sunday morning to getting laundry sorted after a week in Paris and Normandy! 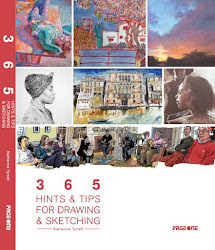 This delayed our visit with Ronell (African Tapestry /My French Kitchen/Coin Perdu) whose home is in Montlouis-sur-Loire to the east of Tours. However it was great to meet up with Ronell and to be shown around Ronell's home for troglodytes! :) Of course I forgot to take photos! 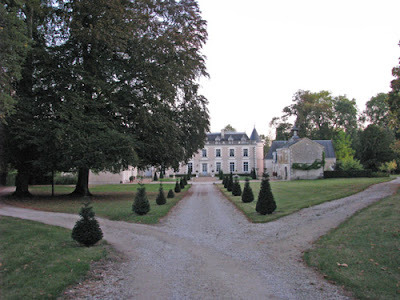 Ronell was most generous with guide books and advice about which chateaux were good to visit. 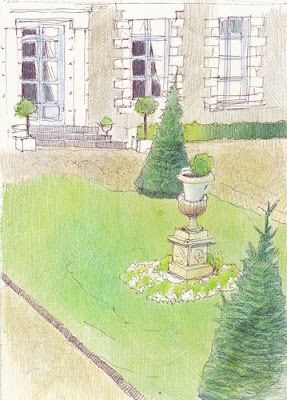 On the right is a less successful sketch (in composition terms) that I did of the front of the chateau and the lawn in front. I'd been on my way out to sketch and it started to rain so I needed to draw what I could see from my bedroom- and didn't want to repeat the sketch I'd already done! I soon found out that trying to capture neutral tones of the wall and the gravel was much more difficult than it looked! the cylindrical cones of the fir trees were not that easy either. Below is a sketch of the stretch of road between the and the tunnel under the railway bridge which carries the fast trains to Paris. The leaves on the trees were just beginning to change colour. It was great to have countryside to sketch on the doorstep - and this was a rather nice way of having some time out after a long day. 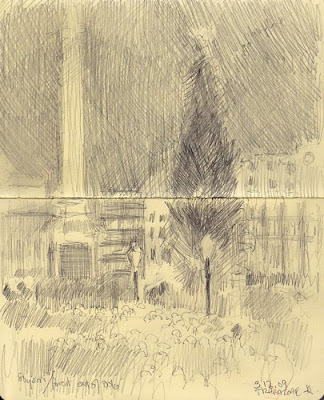 Last night, at around 6 o'clock, I was stood on one of the grass platforms outside the National Gallery sketching the scene in Trafalgar Square in the dark! 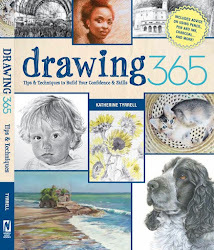 I could barely see to write annotations never mind draw! The lights on the 80 year old spruce tree in Trafalgar Square, which is sent each year as a present by the people of Norway, were due to be switched on by the Mayor of Oslo. 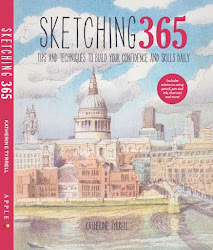 My sketch is of the crowd and Trafalgar Square in the darkness while the huge crowds waited for the choristers and the Mayors of Westminster and Oslo to arrive. It was certainly a very nice ceremony when it started spoilt only by a very silly police car which had its siren blaring the whole time the Mayor was speaking. The article on wikipedia about the The Christmas Tree in Trafalgar Square explains the history of the annual gift which has taken place each year since 1947. I think all the London Mayors get invited to the lights ceremony. I draw this conclusion because I was very tempted as I left the Square to take photographs of the huge numbers of mayoral cars which were double parked on the double yellow lines on Duncannon Street. Of course if you've been invited by the Mayor of Westminster I guess it comes with some sort of dispensation on parking! 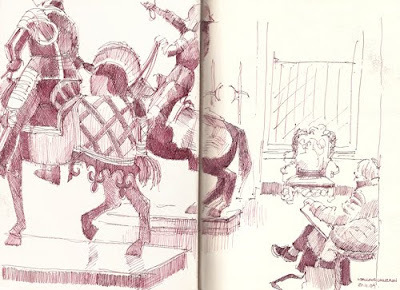 I visited the Wallace Collection in Hertford House in Manchester Square on Friday morning with one of my drawing groups. I'd never been before (one of my "to do" list items which seemed to get done!) and was so impressed that I returned for more sketching and more looks at the collection in the afternoon. It's worth noting though that the paintings in the collection are mostly viewed in the context of furniture and other artifacts of the period and that all the paintings, furniture, sculpture, glass and decorative artwork look extremely good suggesting that the conservation practiced by the Musuem is of a very high quality. To preserve the Collection and Hertford House for future generations to enjoy in accordance with the bequest of Lady Wallace, retaining the essential character of a family house; to maintain and develop the quality of scholarship and practical skills of the curatorial, conservation, education and library/archival staff; through the content and the quality of the Collection and by nurturing our expertise, to continue as a centre of excellence, at home and internationally, in Eighteenth Century fine and decorative arts and Nineteenth Century collecting. 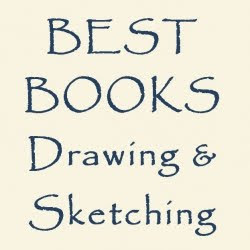 I did three sketches. 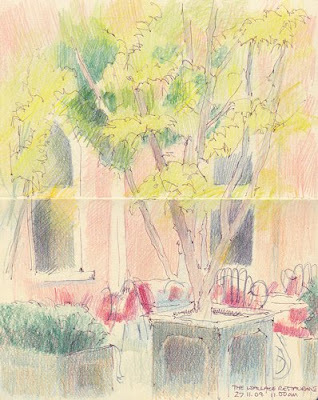 My first sketch was of a corner of The Wallace Restaurant - which has plaster pink walls, an Atrium Roof and potted trees. It's interesting how many museums and art collections now release space in the main building by creating a glass roof for their central courtyards. This particular courtyard now houses yet another one of Oliver Peyton’s café and brasseries - as seen in the National Dining Rooms and the National Cafe at the National Gallery - which have, as regular readers will know, also been the subject of my sketches (see Interiors on my portfolio 'pastels and pencils' website). 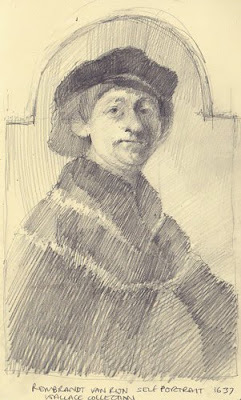 I also tried my hand at yet another Rembrandt Self-portrait - this time one from the year 1637. For some unaccountable reason actor Martin Freeman (from The Office and The Hitchhiker's Guide to the Galaxy) appears to be descended from Rembrandt. My third sketch was the one you can see at the top - of another member of my group sketching the very impressive models of soldiers and their horses. Apparently the one with his arm raised is an example of 15th century 'Gothic' equestrian armour from South Germany. I started a fourth which I really need to try and finish if I can. Mind you it is of the whole of one end of the Great Gallery which is a hugely impressive room so that might take a little time!